I am a twenty six year old novelist and dance and gym teacher with a wonderfully handsome husband and two horrible dogs. I'm trying my hand at fanfiction in an attempt to keep from getting any actual work done. Bella is convinced that Edward has fallen out of love with her. His constant disappearances, his avoidance of her touch - there are so many signs that it's true. But when she starts to notice some strange changes in Edward and Alice, Bella starts to suspect that something else is going on. 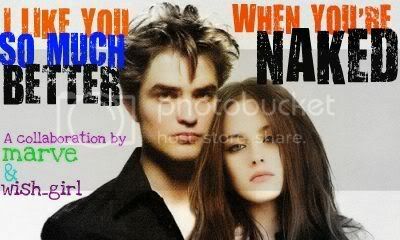 Marve's Edward meets Wish_girl's Bella in high school. Hilarity and hijinks ensue. Now, I love every single one of the Twilight characters, especially angsty, overprotective Edward, but let's face it - sometimes they can go overboard. This is a parody of the characters' personalities.